My mom got me a Diamond Indulgence card a few months ago. This a privilege card that gives access to exclusive discounts and exciting perks at Diamond Hotel, Philippines. It is only last month that I made use of this card for my birthday treat with friends and another lunch with the family for my mom’s birthday, both at Corniche. Corniche is a restaurant located at the lobby of Diamond Hotel. It offers breakfast, lunch and dinner buffet and an all-day a la carte menu. As earlier said, I’ve been in this place twice last month for 2 special occasion – my birthday and my mom’s birthday. I chose this place simply because I want to use my Diamond Indulgence card and nothing more. I had my first lunch there with friends as a birthday advance treat. I like the place because of its magnificent interior. They really made great use of the lobby well. Too bad we were seated a bit far from the buffet table as it was on the other side of the restaurant. Good thing in my second visit, we were seated nearer the buffet table and entrance. For both of my visit, I would have to say the service was consistent. I had no problems from the start of making a reservation until the end of getting the receipt. The food is a different story though. Some of my friends thought that generally the food was a bit salty. My brother commented that it was not as good compared to other hotels we’ve been to. In my case, however, I just thought that it was not bad at all, but not great either. In short, there was nothing spectacular about it. 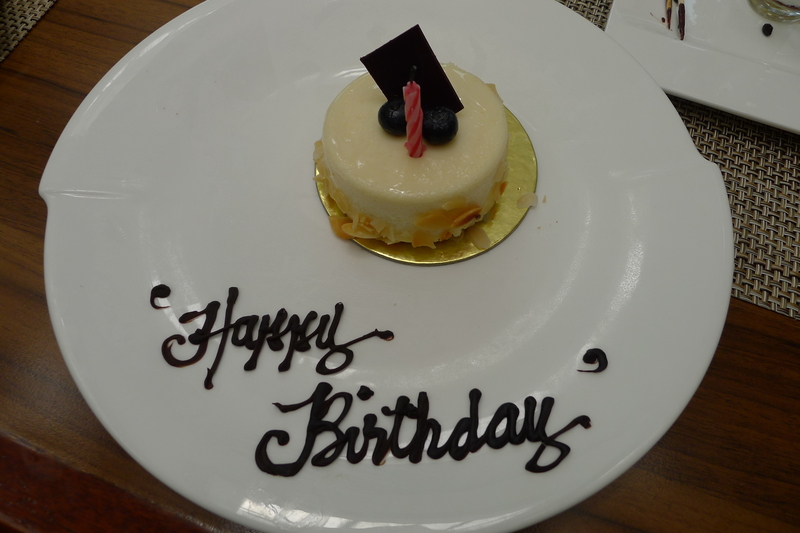 Well, there was one exception – THE BIRTHDAY CAKE! Its just a single serving complementary cake. Despite the size…and considering its free… it was surprisingly good. Turns out the cake they gave away was from Kohikan at the Diamond. Kohikan at the Diamond is technically the coffee shop of the hotel. Those complementary birthday cakes can be bought there for P250 each. Expensive right? But I can assure you, it’s worth it because it’s so damn good. If I’m not mistaken, it’s the same cake being sold at The Cake Club in Rockwell. Fortunately for us, since we’re birthday celebrants, we got those for free! I guess Corniche didn’t wow me because I’ve been to numerous hotelrestaurant in the past. I’ve continually compared all the places I’ve been to and sad to say Corniche was not on top of my list (but not in the bottom either). Nevertheless, I did enjoy dining there simply because I was with my family and friends. Kohikan is a different story though. I speak highly of their cakes (despite being overpriced). 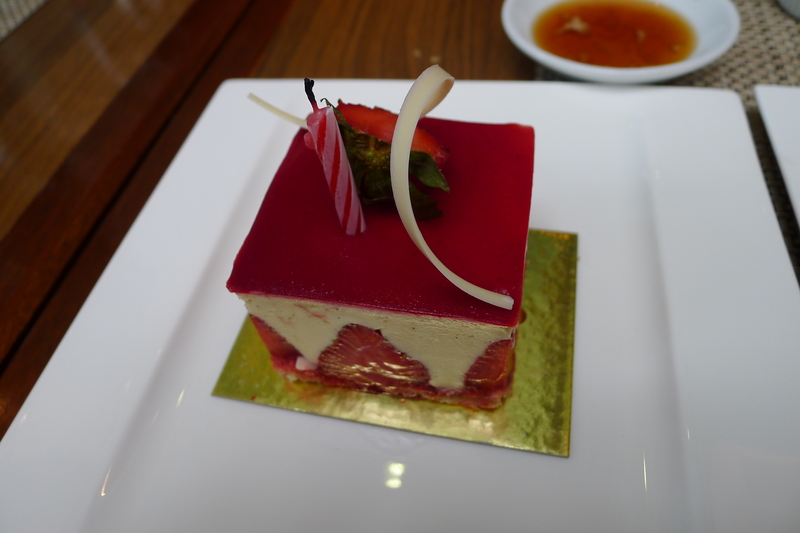 So if ever I would be back at Diamond Hotel, I know what to get myself – a piece of cake! wow. that’s a nice birthday treat!